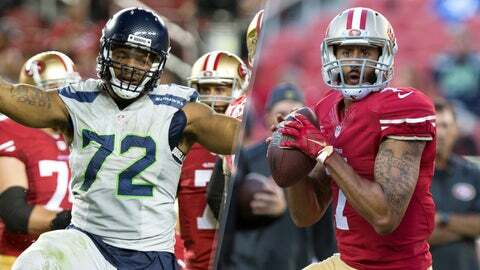 Seahawks defensive end Michael Bennett (left) recorded 3 1/2 sacks against 49ers quarterback Colin Kaepernick (right), who did not have a rushing attempt for the first time in his career. The NFL regular season is more volatile on a week to week basis than the stock market. One team who lost by several touchdowns the week before can follow up the next week with a blowout victory. Players who are responsible for the blame one week could be responsible for a game-winning play the very next game. With Week 7 of the regular season in the books, let’s take a look at three NFC West players who saw their stock rise, and three NFC West players who saw it fall as we get set for Week 8. After missing 2 1/2 games due to injury, Lynch ran for 54 yards and a TD on 17 carries in a Week 6 loss as the Seahawks blew another fourth-quarter lead. Seattle made it a point to feed Lynch in a Week 7 matchup at San Francisco and he responded with 122 yards and a TD on 27 attempts. It was the most carries for Lynch since the 2013 season and helped the Seahawks control the clock for 38 minutes. Johnson was bottled up and limited to 40 yards on only 11 carries in a Week 6 loss to Pittsburgh, but he bounced back in a big way. Johnson scored an early touchdown on a highlight-reel run and finished with 122 yards rushing in a 26-18 victory over the Ravens. It was the third 100-yard game for Johnson, who is second in the league with 567 yards rushing. With his team reeling from back-to-back losses entering a Week 7 matchup at San Francisco, Bennett set the tone for a defense that appeared to lose its swagger. He registered a career-high 3 1/2 sacks to go with three tackles for losses and four quarterback hits in a dominating 20-3 win. The performance lifted Bennett into a tie for the league lead with 6 1/2 sacks. Kaepernick had quieted his critics with strong back-to-back games, including a 340-yard, two-touchdown effort in Week 6 that snapped the 49ers’ four-game losing streak. Then the rival Seattle Seahawks came to town. Kaepernick finished 13-of-24 for a mere 124 yards and, for the first time in his career, did not have a single rushing attempt. Zuerlein owns the worst percentage in the league with a conversion rate of 61.5 percent, but Rams coach Jeff Fisher deserves an assist for his current slump. Zuerlein is only 2-of-7 over the past two games, but four of the attempts were beyond 50 yards and two were from over 60. Yet he also missed a 35-yarder in Week 7 with offensively challenged St. Louis nursing a four-point lead. Smith has always been a one-dimensional receiver, specializing in the deep ball but rarely seeing a high volume of passes. His stats in his first year with the 49ers attest to that: 14 catches in seven games with touchdown receptions of 76 and 75 yards. Still, he did not have a catch and was targeted only once in a Week 7 loss to the Seahawks.